This a wonderful hike with a steep slickrock approach to a high mountain peak overlooking some of the most beautiful scenery in Zion National Park. This hike involves a lot of up and down and some 4th class scrambling. It's a strenuous one day hike and best done in the cooler months of spring and fall. As a summer hike one should plan to start at 5:30 AM and return in the late afternoon when the sun is being shaded by Mountain of the Sun and Twin Brothers. Equipment: Sticky rubber shoes, 4 quarts of water per person, energy foods, sun protective clothing, emergency bivouac gear, sticky rubber shoes, camera and possibly an 80' piece of rope for the less experienced hiker. Difficulty: Exposed slickrock approach and a steep uphill hike. Trailhead: Canyon Overlook to Upper Pine Creek. Best Season: Spring or Fall. Its difficult to climb the slickrock if the black moss on the slickrock is cold and wet and the canyon is hot in the summer. Do not hike this trail if it is raining or the rock has ice on it. Walking east from the tunnel, the first drainage to the left is Shelf Canyon. Continue up the road to the next drainage, located .4 mile from the tunnel. This is Upper Pine Creek. Drop down into the sandy bottom of the drainage and hike north for about .5 mile to the waterfall. Just past the waterfall is the best location to climb up (west) the slickrock. Note how the rock curves down, just to the left of the waterfall. Water runs through Pine Creek so prepare to get your feet wet. The summit of mountain of the sun. Pick your way up the weaknesses always being aware of ledge systems that make the travel easier. Soon there is a fairly steep section that wants to draw you to the right, but if you continue up and to the left on the steep slab, the travel soon becomes much easier. You will eventually gain a plateau and much easier traveling as you bear to your right a bit. Aim for a large drainage in the center of what is soon to become a large slickrock basin. Once inside the basin aim for the right (north) side of the basin where you will find ramps that will take you up higher into the basin. Enter the canyon floor, just behind Twin Brothers, but instead of going left towards Spry Canyon, turn right up the wash at the bottom of the rock face of Twin Brothers. There may be a slight amount of bushwacking, but the going is easy as the incline to climb is moderate. After following the wash for less than .25 mile you will top out on a sharp, prominent saddle that divides the direction of flow of washes. For the next .5 mile or so the descent will be steep and bouldery. Route finding the easiest way down becomes the norm. Soon after, the canyon floor yields to gentler travel and slowly the canyon opens and closes. At .7 mile from the saddle the canyon opens to a large slickrock clearing. Look back (south) and notice the slickrock and vegetated ridge (ramp) ascending to the south. This is the ridge to follow up to the saddle south of Mountain of the Sun and North of Twin Brothers. Cave - Facing downstream, one might notice a small foliage choked wash entering on the left, seemingly draining from the base of Mountain of the Sun. Traveling up this wash a short distance bears an amazing cave that will provide cool shade during a hot day. It is very dark and continues back to a chamber. 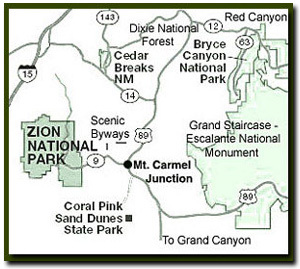 A must to see before heading up to the peak of the Mountain of the Sun Canyon. Once at the saddle, approximately .25 mile, turn right (north), and head toward Mountain of the Sun. There may be some minor bushwacking passing onto the north side of the saddle. Once across the saddle the terrain becomes steeper on the southeast flank. Carefully choose a route, heading upward. Soon an 80' high slab of low angle slickrock must be negotiated. After arriving at the top of this slickrock and by following the drainage on the eastern side of Mountain of the Sun, the route becomes more obvious and will eventually lead to the last steep ramp to negotiate. The exposure becomes apparent as the ramp bears west, however there are a few trees in the middle of the loose rock and dirt ramp to assist in the progress upward. From here it is a short scramble of 200 yards to arrive at the top. Be sure to sign in at the register in the jar under the pile of rocks. From the top the views are spectacular and will give an opportunity to shoot some beautiful photos. The route back is long and tedious so give plenty of time for the return trip.